Rushana Bright is a Couture House and Alteration services founded in 2018. We offer formal and special occasion dresses for women at an affordable price. We make and sell clothes both online, as well as in a physical store. There are many reasons why we wanted to create couture house in 2018. We analyzed the current fashion trends in the US and found out that there are a number of problems we want to solve, which we could do if we created our own couture house, which we named Rushana Bright. There are lots of clothing choices for women who want to go to get dressed for a special occasion in 2018. However, even after all the different options and choices available to women, they still face the problem of not being able to find the right dress for the right price. Besides, if a woman wants to stand out with different design and have some originality for her special event, she may actually realize there are not that many options. Women who want to shop for one of a kind, unique outfits that nobody has seen before, face the difficulties and challenges that we’d like to help solve. The first challenge is to find a unique dress by an authentic brand in the USA. Today, the fashion world is led by big brands like Dior, Gucci, D&G and so on. Some not-so-reputable, smaller fashion designers from all around the world often create the same dresses by slightly modifying what was created by the bigger brands. 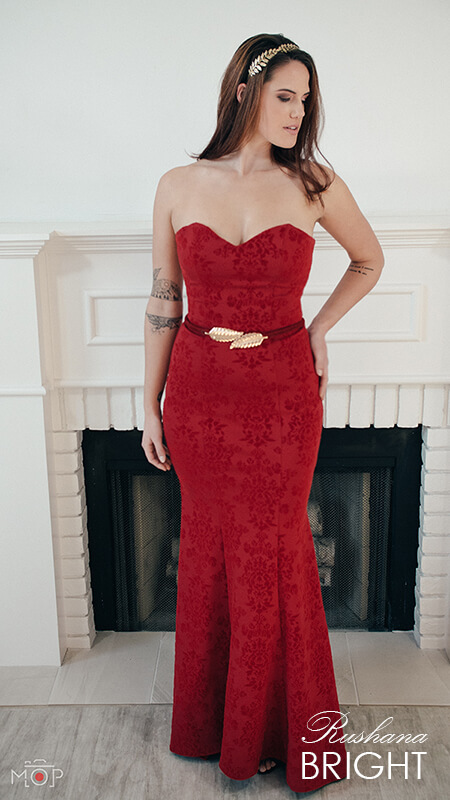 There are unique dresses created by smaller brands too. However, we thought that it would be wonderful if women had more choices. It would be fair if people were able to buy high-quality, handmade and one-of-a-kind dresses for an affordable price. Our dresses are unique in both style and make. One example of this is the Red Velvet Roses Gown. 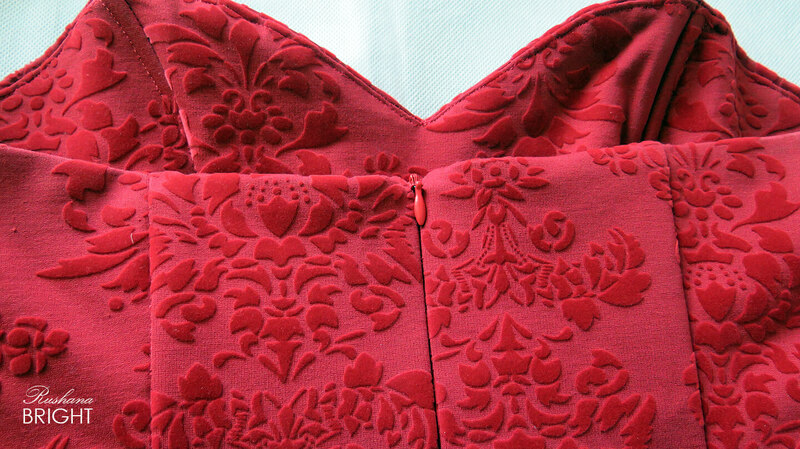 The dress is sewn with a bodice that would fit well on one’s figure, made with special corset bones. We’ve chosen the high-quality velvet fabric with roses to depict the formality and to give a celebrity type-of-look for the wearer. We complemented the dress with the golden belts that look like leaves. 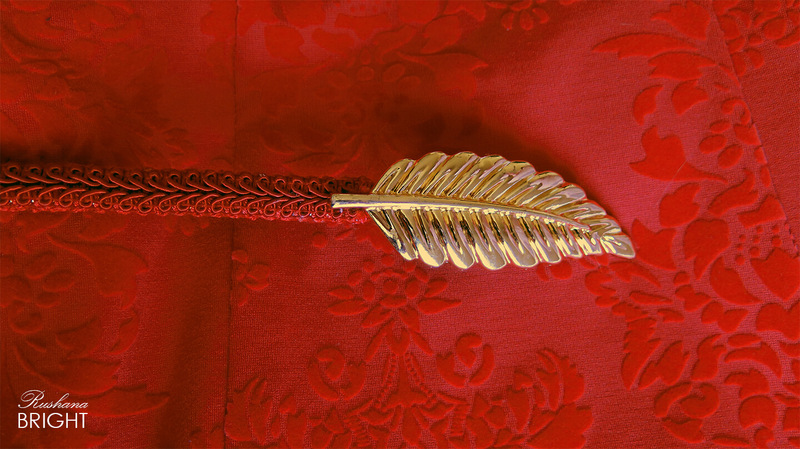 Golden leaves on the belt complement the rose like patterns, and they also give an elegant look. The belt is made of gold-colored stainless steel. Also, our dresses are qualitatively processed from the inside. 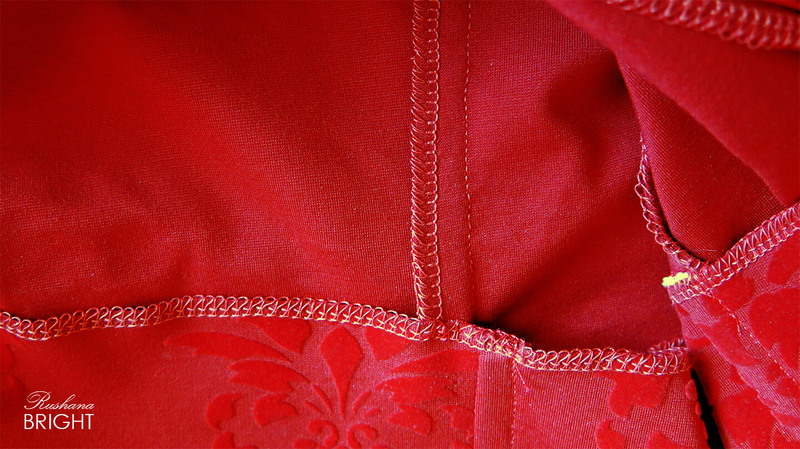 All seams inside the dress are overlocked. The second difficulty is the unavailability of personalization and customization made to the dress. Because most dresses sold in boutiques are already designed and fitted in a certain style and shape to be sold to you, there is not much you can do with the dress. Yes, you can always buy the dress at the boutique and then use a nearby alteration service, however, we think that women do have a right to get their personalized dress right from the start, without wasting their time getting it changed to fit them. The third challenge is the whole experience of buying or getting the dress itself. Most women who prefer to buy luxury clothes want the unique shopping experience. It’s the whole experience of searching for the dress, finding the right one, customizing it, getting support, the after-purchase experience and more. However, you will not see much creativity in what is being offered by the luxury stores and boutiques. We think that customers deserve the best, so we will constantly use our creativity to offer a unique in-store experience that our shoppers have not seen anywhere before. We can accomplish this by using technology. We will be early adopters of technology where it’s needed. We will use our website as one of the means of supporting our customers. Last, but not least, we found out that most luxury clothes were not created by keeping the working woman in mind. The busy businesswomen who want to shine for her important presentation or event, while looking formal at the same time, does not have that many options. We intend to change that. Working women can also look extremely beautiful in office-like suits. We offer handmade blazers and suits which crave the eyes of others because of extra attention to the details. As a result, women will look both serious and beautiful in their business-related special occasion. 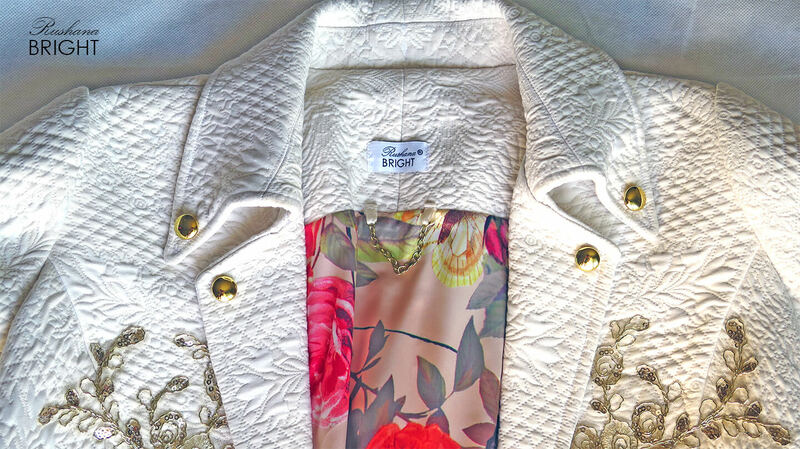 This blazer is one of those dresses that can be worn both for the special occasion and for work. The blazer dress is made from well-shaped, high-quality fabric with beautiful ornamentation. 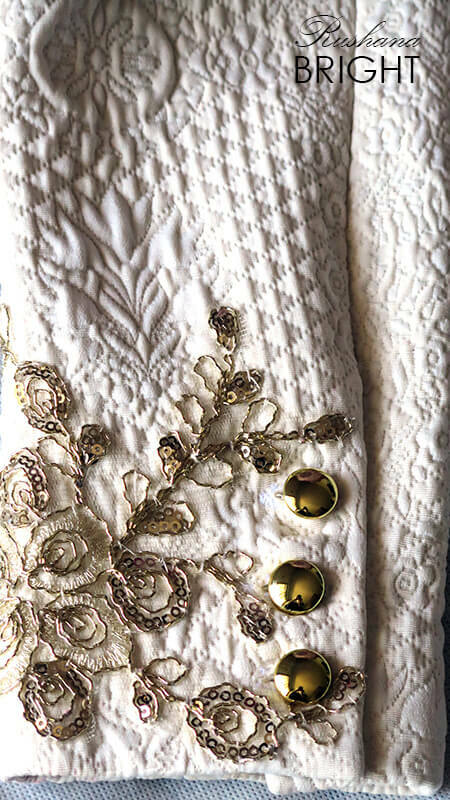 The front side of the dress is decorated with gold flowers and sleeves with gold buttons, and the collar is made according to the English pattern. 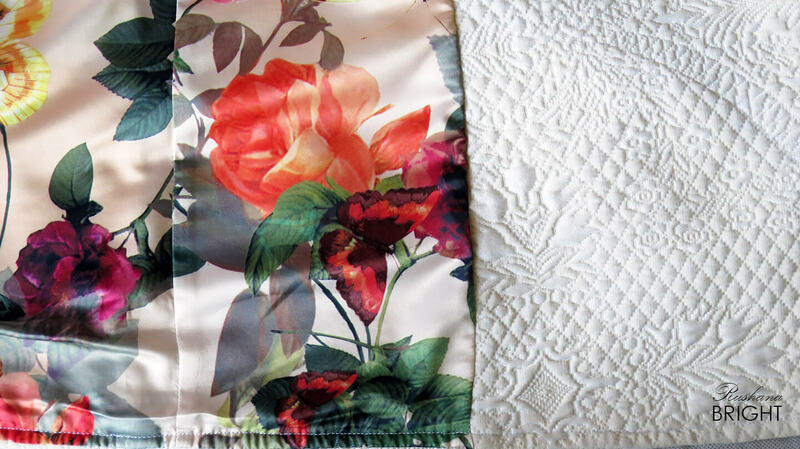 The lining is made of a colored satin, with multi-colored flowers. The sleeve is two-seam, which allows you to fit well in your hands, and it is decorated with gold flowers and gold buttons. What Motivates Us to Create these Clothes? We become proud of ourselves and others when we see that people enjoy our outfits. All of us are unique and special, and we like to emphasize this with a beautiful set of clothes. We want girls to feel special wearing clothes from Rushana Bright. When a model walks the runway in a handmade dress, as a designer, you realize that you left a part of yourself in this work and such moments excite you. A great motivation for us is positive feedback and seeing the admiration of our customers. Traveling is a big inspiration for us. We create new designs inspired by travel. We discover different styles and cultures and try to apply the best in every culture when creating our clothes. Who is Behind Rushana Bright? Rushana Bright is a family owned business run by a husband and wife team. Rushana Yuldasheva is a fashion designer, born in Uzbekistan. She uses the rich history and cultural heritage of Central Asia in designing her masterpieces. She regards each dress as a work of art. Rushana has been passionate about sewing and designing clothes since her childhood, and she learned everything from her mother. Samarkand, the city where she was born, is rich with all forms of art left by history. Our core values define how we do business, how we treat the people around us and how we interact with others. At Rushana Bright, our first core principle and value is the truthfulness. We offer only truthful information about the product and we are transparent about the materials we use. However, our truthfulness goes beyond the product or services we offer to our customers. We are also truthful in our marketing efforts, in our relationships with partners, and our community. We are transparent about who we are and what we do. Since ancient times, clothes have been a main part of people’s lives and the way that people express themselves. Clothes made by local masters were valued because they knew the history, culture, and values of their people. We brought the culture and history of clothing from Uzbekistan to the United States. This is what makes our clothes unique. We use a variety of colors and styles, textures, flowers and stones to show the work of art that originated many years ago. For us, every image, like a work of art, is made of quality material and created with love. We create unique, authentic clothes that give people joy, make their life brighter and more interesting. We follow the latest trends in the fashion industry and we join the latest trends with our own vision, defining our clothes as beautiful, authentic, and luxurious. We provide a unique approach to each customer by designing her future dress and letting her feel she is a designer of her own dress. We always believed that clothes are a reflection of our thoughts and feelings. Beautifying people with clothes, we want to beautify the world, make it bright, colorful and stylish. And finally, we believe we can make every woman happy. We believe every woman is beautiful. We are committed to making every woman special. We seek to enhance and reveal her own unique beauty to both herself and the World. Evening dresses can simply break or make your visual aspect. Always go for the right size, colour, suitable material, the occasion and your figure when choosing to buy the dress of your choice. Totally agree with you! Always need to pay attention to details when you choose your dress. And the help of a professional fashion designer is one of the right things need to do in this situation.